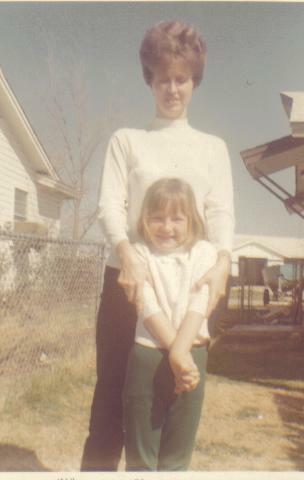 Shortly after I moved to Kerrville, my niece, Vickie, and I began planning to move Mother down here as well. She had lived alone, the past 18 years, in east Texas on 11 acres that Dad bought for his retirement. When Dad died just before his 67th birthday, Mother stayed out there, working at the local grocery store. For the last few years, my sister, Margie, lived out there with her, attending nursing school. About three years ago, Margie had at least one heart attack and/or series of strokes (we’re not really sure which came first), and her health gradually declined until she passed away just before Christmas last year. Mother decided to retire, sell her house and land, and rent an apartment in Dallas. We told her there was no place in Dallas that she would feel was affordable, that we would feel was safe. And so, after receiving my brother’s blessings, she agreed to move to Kerrville to live with me. I rented a 3/2/1 duplex on the edge of town, and my niece in Dallas, Lisa, spent every weekend for a couple of months driving to Mom’s to help her pack up. On Moving Day, Lisa miraculously assembled a small army of sons, nephews, and friends, and her sister, Vickie, who lives in Kerrville, and their brother, Walter, and I all converged east of Wills Point, Texas to rent a moving van and trailer, pack Mother’s house, and carry her, all her earthly belongings, and her 1983 Dodge pickup 330 miles away from where she had lived for over 20 years, her last home with Dad. It’s been an interesting adjustment for both of us. I’ve gone from not having a television and rarely even turning on a radio, to having a LARGE television on MAXIMUM VOLUME going from 8 a.m. to 10 p.m., seven days per week. Mother has gone from knowing her way all around her small community, to a different (and slightly larger) community where she knows nothing and no one. She starts her pickup once a week so the battery won’t die, but she doesn’t want to try to drive it anywhere. She’s afraid she won’t find her way either to where she’s going or back home. Mother makes coffee every morning, and graciously wakes me around 7 a.m. We read the newspaper together, commenting on local events and national tragedies. She keeps me apprised of select sports scores (Tiger Woods has somehow captured her imagination, although neither she nor anyone we know has ever played golf) and I tell her about local art events that are coming up, although we have yet to attend one. I now come home for lunch every day at noon, and cook dinner every evening, something I haven’t done regularly in several years. I started out washing the dishes as well, but Mother has since begun doing them during the day, so I usually just wash the pots used for cooking after I put leftover food away. I was appalled at Mother’s diet (pot pies, TV dinners, and sometimes cereal for dinner), but then I realized that mine has not that much better (ramen, sardines and crackers, and sometimes vegetables with ranch dressing), so perhaps that is just the lot of single people who feel it’s too much trouble to cook for just one. In any case, we are both eating better, and I am slowly rebuilding my rather atrophied culinary muscles. Vickie tells me her grandmother looks so much better in the month since she’s moved here, that her posture, balance, and overall appearance have all improved, as well as her general mood. I have noticed it, too, at least the mood part. I know she was kind of in shock after the move, as I was with so many changes in the past few months. And I suppose we both are benefiting from an improved diet. We bought a couch yesterday, which will be delivered this coming Wednesday, along with my mattress and box springs, so that we will be able to watch TV while sitting on something more comfortable than dining room chairs, and I will get to sleep on something that is neither a couch nor an inflatable mattress, for the first time in about five months.